It is the first question people ask us. Friends, family, total strangers. They all want answers. Our caseworker began making inquiries three months ago. More recently a coworker grilled me about our future plans. This past weekend the attendant at the zoo suggested we add another name to our family membership “just in case”. So when are you having another kid? Another kid? Two years ago we were childless and now we have two sons. Two kids in two years. I’m 40 years old. I need time to bounce back. I need to do my kegels. I need to research vaginal rejuvenation. C’mon, even those TLC families get a break between kids! But then we aren’t like those families. Our stretch marks are from donuts, not childbirth. Our children were ripped from someone else’s womb. Our kids arrived walking, talking, and (mostly) housebroken. But still, nonexistent birth trauma notwithstanding, two kids in two years is…overwhelming. I remember thinking after our first kid that we should adopt a second kid because if we had a second kid he would entertain the first kid and then I could go back to yoga and stop drinking all the time. Everything would be so much easier because (obviously) two kids would be less work. We were, as the French say, naïve. Two kids is not less work. Two kids is not even twice the work. Two kids is ten times the work. The fighting, the screaming, the tears — and that’s just Todd and I. There are days when I walk into the boys’ bedroom and it’s like a scene from Lord of the Flies. Of course I’m stalling…searching for the answer because the truth is I don’t have an answer to that particular question. It changes from day to day. We have been lucky twice. Four people in a world of seven billion came together and created a family; they found each other across four decades and thousands of miles and hundreds of bad life choices. What are the odds? It’s hard to imagine there is a fifth or sixth or tenth member of our family still waiting for us to find him. …except what if there is? 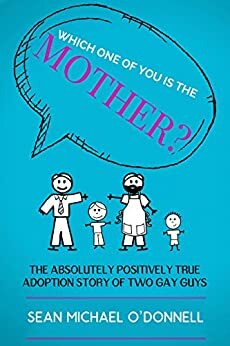 Read more about my adventures as a gay adoptive father in my book Which One of You is the Mother? Available for pre-order on Amazon now. Release date August 24, 2015.